It's been a little while since we've reviewed anything from Xigmatek, and it's about time we make up for that in a big way. When I say big, I mean &#34;BIG&#34;. 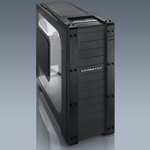 Today's review sample comes in the form of the Xigmatek Elysium Super Tower Chassis. The Elysium is geared toward the larger HPTX and XL-ATX platforms like the EVGA X58 Classified 4-way SLI (SR2) board. With the option to run dual PSU's, and take a motherboard as large as the HPTX form factor, it's going to easily cater to the high end gaming rigs. So let's dive in and see what we got.